Although engines and other vehicles have been used in fire suppression for many years, surprisingly little has been written about firefighters becoming entrapped in engines. Many of the early field studies took place in Australia. Australians continue to study the safety of firefighters entrapped in their vehicles (Figure 5), as well as the safety of the general population as they attempt to flee from rapidly spreading bush fires. Figure 5-This engine burned during the 1990 Toolara Fire in Australia. Three firefighters were trapped, one of whom was badly burned when he ran for safety. The other two men stayed in the vehicle, spraying themselves with water until the tires caught fire. Then they too ran for safety. In a 1972 report, Studies in Human Survival in Bushfires, Cheney reported that temperatures within a few feet of the ground and within a few feet of trees up to 35 feet (11 m) tall were lower than 120 °F (49 °C). In vehicle tests, car windows blocked half the radiant heat, but occupants would have still received severe burns to their bare skin. Within 4 minutes after the test fire was ignited, temperatures inside the vehicle reached 390 °F (199 °C). 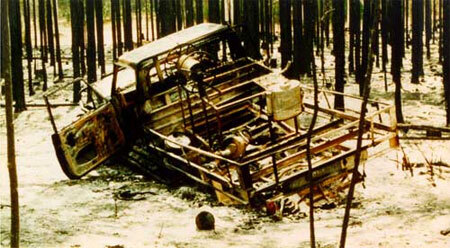 The roof lining and rubber seals burned, filling the cab with thick, dense smoke. Plastic and rubber material used in the interior lining smoked, causing "severe discomfort; tyres were caught alight by severe radiation heating; and 8 to 10 minutes after peak radiation, the engine compartment caught alight and burned strongly." In a 1995 personal communication, Cheney recounted his experience on a bush fire during 1965 when the Australian version of the fire shelter was being developed. He believes he took additional risks because he had a fire shelter, that it was very hot and uncomfortable inside the shelter, and that he would have been safer if he had stayed in his vehicle. In an April 1996 article, New Fire Tactics for New Car Fires, Bill Gustin discusses the hydrocarbon-based synthetic materials now used to reduce vehicle weight. He says that these materials produce thick, toxic smoke, "a witches brew of toxic gases." He also discusses the possibility of explosions from tires, batteries, hollow drive shafts, and components of the air-conditioning system. The plastic fuel lines used in newer vehicles carry gasoline at 15 to 90 psi. An electric fuel pump pumps gasoline from the tank to the engine. If a fire causes the fuel line to leak, gasoline will be under pressure, resulting in a sudden, intense fire fed by a spray of atomized gasoline. Fuel tanks can no longer be vented to the atmosphere because of environmental concerns. Instead, vapors are pumped into a charcoal canister in the engine compartment. Excessive pressure from the heat of a fire could cause the fuel tank to leak along a seam, spilling fuel to the ground, increasing a fire's intensity. Fuel tanks made of polypropylene are lighter than metal tanks, but would melt more quickly.